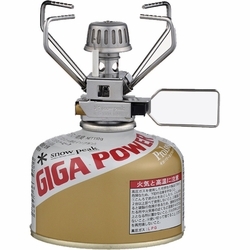 Snow Peak Giga Power Stove Auto. Snow Peak's most popular and trusted stove just got better. The GigaPower 2.0 Auto packs the same trusted punch as the orginal GigaPower Stove but now within a lighter and more robust construction. Dimensions	D 4.2" H 2.6"